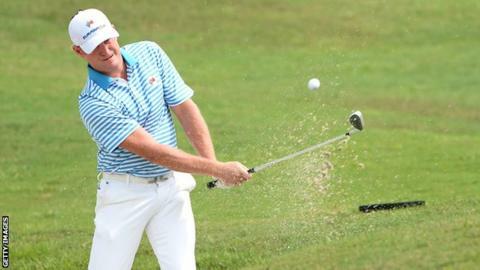 Wales' number one golfer Jamie Donaldson says he has the game to tame Augusta. Donaldson arrives at the Masters as the current European Tour Order of Merit leader. Ranked 28th worldwide, he has an unbeaten performance as part of the European team in the EuroAsia Cup. "I enjoy the golf course and have got a good chance of playing very well there on current form," he said. Ahead of the first Major of the year the 38-year-old added: "Augusta is predominantly a drawing golf course where hitting it right to left is very important to create a score. "I'm looking forward to it - I'm going to be hitting a few shots this week to get that draw moving and hopefully get off and running." Pontypridd-born Donaldson is playing some of the most consistent golf in his career. He tied second in the Nedbank Golf Challenge in South Africa and again just missed out on a title with a second place in the WGC - Cadillac Championship in Florida. That result gave him a temporary membership on the US PGA Tour with Donaldson now basing himself and young family in the States. In just seven events of the 2014 season Donaldson has amassed over one million Euros - a sum which has elevated him to the top of the European Tours Race to Dubai order of merit rankings - although he insists that doesn't put any extra pressure on him as he drives up Magnolia Lane for just the second time. "The only time Order of Merits are of use to anyone is at the end of the season. Up until then it just jostles up and down. "It was nice to have played last year and get that experience under my belt. "The greens are going to be lightening quick, so you've got to make sure you don short-side yourself. Donaldson's 2013 Masters debut holds mixed emotions for the Welshman - he failed to make the cut with rounds of 74 and 75 for a 5 over par total - however he did mark his first outing amongst the Azaleas by holing his tee shot on the 180-yard par three sixth hole, becoming only the fifth player to achieve a hole-in-one there in the event's history. "That would be lovely (to repeat that) hopefully I can do that on 16th this year!"